Fred Norman, 19, in 1943 when he enlisted. I met one of the last Americans to see Churchill, Stalin and Truman together and who also has met several Hollywood stars. On Wednesday, I was excited about the interview and wore a skirt and turtleneck rather than my usual outfit of jeans. I wanted to show respect to this particular interviewee. It was already a crazy morning after driving 20 minutes to a wreck and I was running a little late for our 10 a.m. appointment. I pulled up to a beautiful ranch style home, I later found out he and his wife built it in 1954, and was greeted at the door by 88-year-old Fred Norman before I even rang the doorbell. I’d seen younger photos of him and he looked basically the same-still wearing his hair in the 1940s wave style and a few pounds heavier. “Hello! !” he happily said inviting me inside. We sat down and started to talk about his war years. Norman was in the 3rd Army, sixth division (or Super Six) that fought under General George S. Patton. 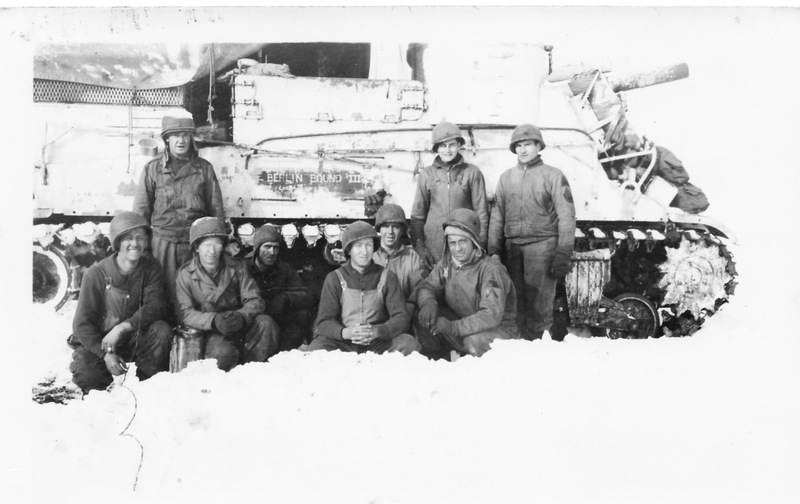 Under Patton he fought in the Siege of Bastogne to relieve the U.S. 101st Airborne Division who was surrounded by the German in the Battle of the Bulge (this is shown in the 1948 film “Battleground”). Norman was with the American, French and British forces who went into Berlin, Germany after the Russians. He was also there with hundreds of other soldiers and tanks that lined the Autobahn as Harry Truman, Winston Churchill and Josef Stalin rode into Berlin for the Potsdam Conference that determined Nazi Germany’s punishment. 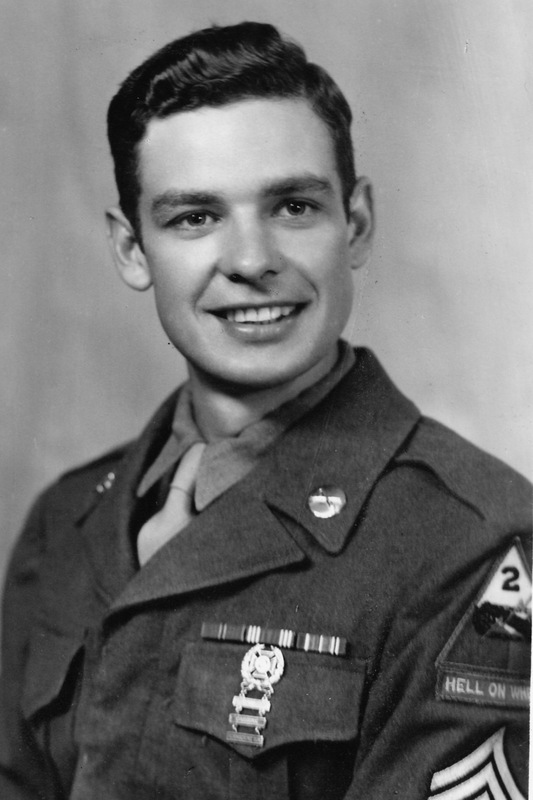 Born and raised in Elkin, N.C., Norman was 19-years-old and a student at University of North Carolina at Chapel Hill when he was drafted into the Army. He was sent to California for basic training before going overseas to England. After the war, Norman married his sweetheart since the fourth grade, Nan ‘Hon’ Johnson. She passed away in 2007. Towards the end of the interview I asked if he saw any movie stars or went to the Hollywood Canteen while he was in California for training. “I saw a bunch of stars when I went to Hollywood, but I don’t think you’d know anything about them,” he said. I quickly said I was actually a big movie fan. Mr. Norman smiled real big and we talked an extra 30 minutes about people he had seen at the Canteen and during the 1940s and 1950s. Norman and a friend used to travel to New York City to see the Lucky Strike Radio Hour and listen to Frank Sinatra sing. Norman also saw big band leader Kay Kyser several times since they both went to UNC Chapel Hill, but at different times. 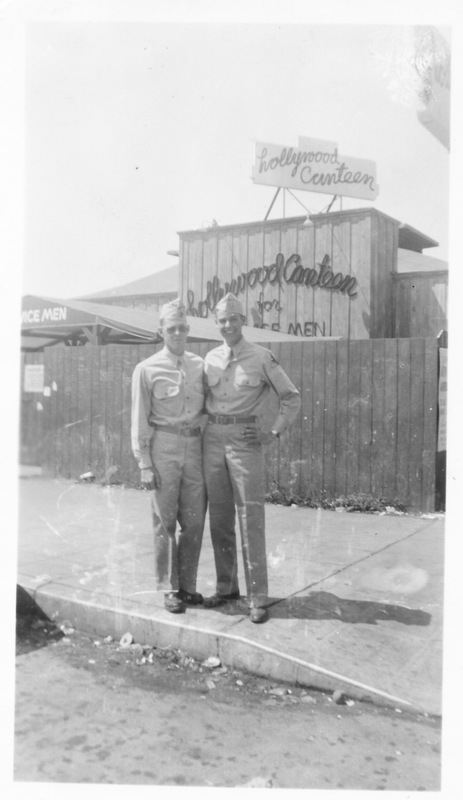 Fred Norman and a friend at the Hollywood Canteen in 1944. While overseas he saw Marlene Dietrich perform. In Berlin, Norman saw one of the most modern theaters he had ever seen. It had 12 doors that lead to every row of seats and an elevator stage. Norman met many incredible actors that we have lost today, but most importantly I’m thankful for what he did for our country. He fought under one of the greatest generals our country will ever see, and is the sweetest man I have ever met. For a long time, Norman didn’t talk about his war experiences. I’m proud that I was able to talk to him, and that I consider this man a friend. Thank you Fred Norman, and all the other veteran’s who have served our country. 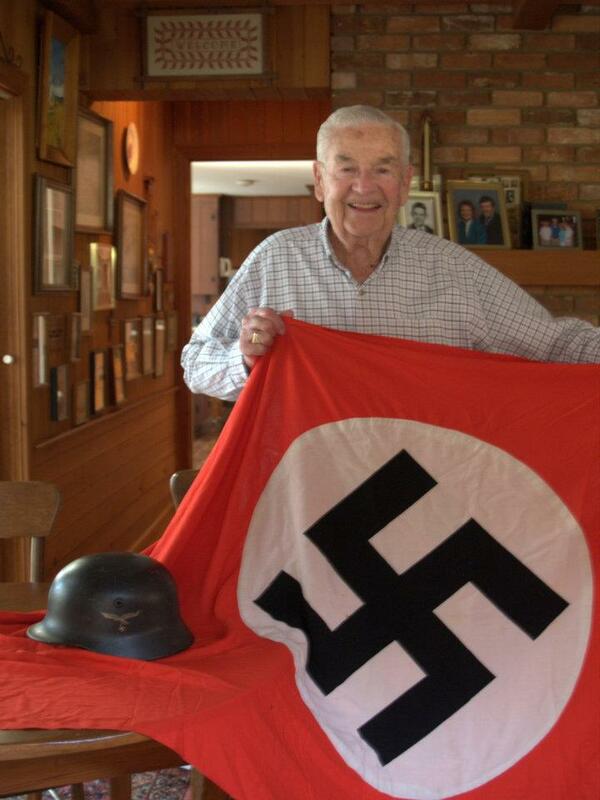 Fred Norman today showing off his Nazi helmet and flag he captured during WW2. Check out the Comet Over Hollywood Facebook page . This entry was posted in Holidays, Hollywood and the Military and tagged Bastonge Veteran, classic film, Elkin NC, Frank Sinatra, Fred Norman, General George S. Patton, Marlene Dietrich, mickey rooney, Siege of Bastogne, veteran, Veterans Day, World War 2, world war 2 veteran, World War Two, ww2 veteran by Jnpickens. Bookmark the permalink. Amazing story, Jessica. It just brings tears to my eyes thinking about all these old veterans who went through so much. I really thought how Tom Brokaw inspired him to start talking about his experiences to be interested. I still need to read the two Greatest Generation books that Brokaw wrote, but I have seen both video/documentaries he did. The stories are really so important for us to preserve, especially now that there are fewer and fewer WWII vets left. Thanks again for sharing this. Perfect for Veteran’s Day. I meant to say that I thought the part about how Brokaw inspired him to be *interesting*…not interested. Gosh, I need to remember to proofread! I agree I get emotional about it too. I’ll have to admit, I got a bit chocked up during the interview at times because of how much he and other did for us, but how kind he was after the struggle and horrors he saw. I have one of the Greatest Generation book and have read some of the stories (not all yet) out of it. It’s very good. Such a wonderful tribute to a true hero. And how fascinating it must have been to listen to him talk about his experiences meeting Hollywood stars of yesterday! Thanks so much for giving us the opportunity to meet Mr. Norman through you. So many vets didn’t or couldn’t share their experiences for such a long time. It’s so important to remind young people of the importance of their history. I agree. Once I got angry while reading a message board on IMDB around the time “Sands of Iwo Jima” came out. I couldn’t disagree more-we need to be reminded of our history and that we could maybe be ruled by another country if we hadn’t won the war with the British.